iKNOW is a new horizon scanning and blue sky research project launched by the European Commission. 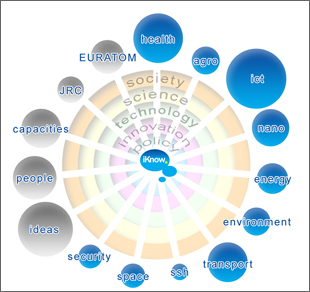 iKNOW aims to advance knowledge and tools related to events and developments (e.g. wild cards & weak signals) potentially shaping and shaking the future of science, technology and innovation (STI). The iKNOW Consortium consists of a team of eight partners with high-level expertise in foresight, technology transfer and STI policy support and significant IT experience. iKNOW puts forward novel ‘horizon scanning 2.0’ approaches which, on the one hand, promote participatory and bottom-up scanning supported by web 2.0 technologies, and, on the other hand, improve information collection, filtering, communication and exploitation. The project is primarily sponsored by the European Commission Directorate General for Research, as part of its Blue Sky initiatives, which are designed to create more proactive European research policy that will be capable of anticipating emerging issues, wild cards and weak signals (WI-WE). Wild Cards are situations/events with perceived low probability of occurrence but potentially high impact if they were to occur. Weak Signals are unclear observables warning us about the probability of future events (including Wild Cards). They implore us to consider alternative interpretations of an issue’s evolution to gauge its potential impact.